The usual Teacher's Day is now celebrated month long. 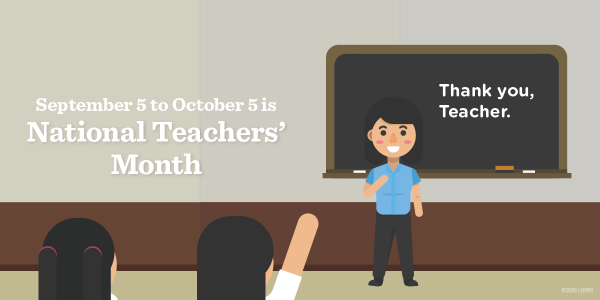 The Department of Education has officiated September as a Teacher's Month and will culminate on October 4, a day before the World Teacher's Day. It is hoped that public and private elementary and high schools shall create activities and events that will honor and recognize their teachers as directed by Department Education Secretary Amin Luistro. The month - long celebration aims to highlight the distinct role, service and commitment of teachers in developing globally - minded citizens, nurturing families, strengthening communities and building the nation.